Dear local leadership: here’s the formula for long-term success. Allow me to summarize for those who aren’t too squeamish: a lot of cities and counties are going to go broke, slashing services and jacking up taxes, all to no avail. The promises made by corrupt politicos cannot possibly be kept, despite constant assurances to the contrary, and those expecting services and taxes to remain untouched will be shocked by the massive cuts in services and the equally massive tax increases that will be imposed in a misguided effort to “save” politically powerful constituencies and fiefdoms. 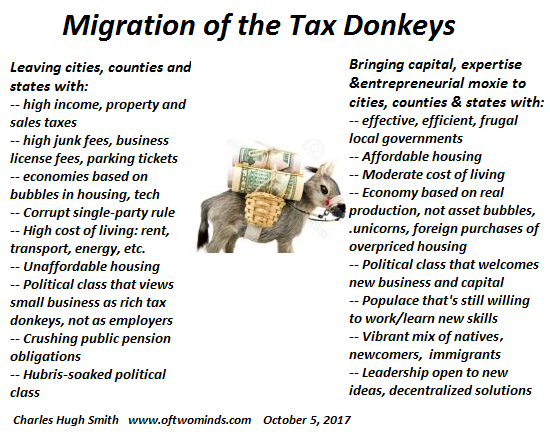 These dynamics will power a Great Migration of the Tax Donkeys from failing cities, counties and states to more frugal, well-managed and small business-friendly locales. I’ve sketched out the migration in this graphic: the move by those who can from incompetently managed and/or corrupt cities/counties/states to more innovative, open, frugal and better-managed locales. Memo to hubris-soaked politicos and elites: in case you haven’t noticed, an increasing number of the most talented and experienced workers can live anywhere they please and submit their output digitally. In other words, they don’t have to live in Brooklyn, Santa Monica or San Francisco. This is the model for many half-farmer, half-X refugees I’ve described elsewhere: people who are moving to homesteads with the networks and skills needed to earn a part-time living in the digital economy. In a lower cost area, they only need to earn a third or even a fourth of their former income to live a much more fulfilling and rewarding life.